A few ways to see the sights! Whether it's winter or summer, getting out in a boat is one of the best ways to enjoy your day! We have so many interesting places to visit and lots of ways to get there. Sanibel Marina offers private fishing/shelling guides who can take you out for the day, as well boat rental that you can take yourself. Captiva Island has four marinas: South Seas, McCarthy's, Jensen's & 'Tween Waters. You can try a sailboat charter, professional guide, private boat rental, or a narrated air conditioned tour boat. Schedules vary, but you can easily go on a sunset cruise, or fishing, shelling or just out to one of the nearby island restaurants. Just to the north of Sanibel and Captiva Island we have un-bridged Upper Captiva Island. Also called North Captiva, the island is about three and a half miles long, with the southern two mile being mostly preserve property. The northern end has electricity, over a hundred homes, and three great restaurants (my favorite is Barnacles). The roads aren't paved and the main transportation is by golf cart. The island also has a 2100 ft private airstrip for some residents. A day spent on Upper Captiva will be remembered for years. 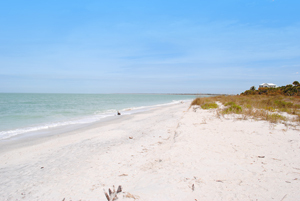 Cayo Costa Island is the next island north of Upper Captiva. 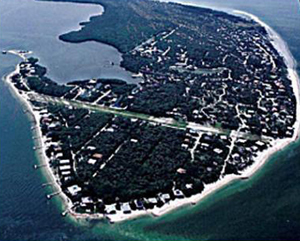 Cayo Costa is a state park and has a small area to camp. There are no amenities except for a rest room. Most people head out there for a day trip and just swim and walk the beach. The island is never crowded and you are sure to find some interesting shells to start your collection. Cabbage Key is probably the most famous island because of its restaurant of the same name. Cabbage Key is a back-bay island so it has no beach, but the true draw to the island is the food and drink. The restaurant sits on top of a Calusa shell mound about 37 feet high, which is pretty high for Florida. The restaurant serves great food and is a popular stop for tour boats and private boats. There is a full bar, and a small menu where the burgers are definitely the best seller. Locals say Jimmy Buffett wrote his hit "Cheeseburger in Paradise" at the Cabbage Key bar. Who knows if this is true, but his signed photo sits behind the bar. An interesting quirk of the restaurant is that guests are allowed to sign a dollar bill and tape it to the walls or ceiling. The place has over ten thousand dollars on the wall and as they fall off, they are donated to local charities. Pretty cool! Useppa Island is a back-bay island just across the intra-coastal waterway from Cabbage Key. Useppa has a ton of history behind it. The Collier Inn Restaurant has a large menu and is set in a more formal setting. The island was a favorite fishing lodge for President Teddy Roosevelt. The island's history can be found at the Barbara L. Sumwalt Museum, located on the island. The island has picturesque walkways that weave throughout giant banyan trees. Definitely a great place to relax and enjoy! Even if you just take a tour boat for a sunset cruise, you are sure to have a great time. A day on the water is a day well spent! Or use my web contact form to tell me what your dream property looks like. Meanwhile, have fun on the water and enjoy!